I am back in Chicago this week and its reminding me of my wonderful studio space I had while I was there. There was always plenty of space and light to accomplish my goals. Right before I left and moved to sunny California I took this photo to catalogue my collection of ritual and altar objects on the large desk I had created for the space. The collection includes the usual wands, shells, stones, and handmade gifts that would be typical on a altar space, and also numerous pieces of childhood memorabilia. I think the three oddest objects in the collection are a fairy house filled with salt, a sarcophagus made entirely of chocolate, and a beanie salamander that I cherish. For the past three years I have attended the Burning Man Festival in Black Rock City, NV. 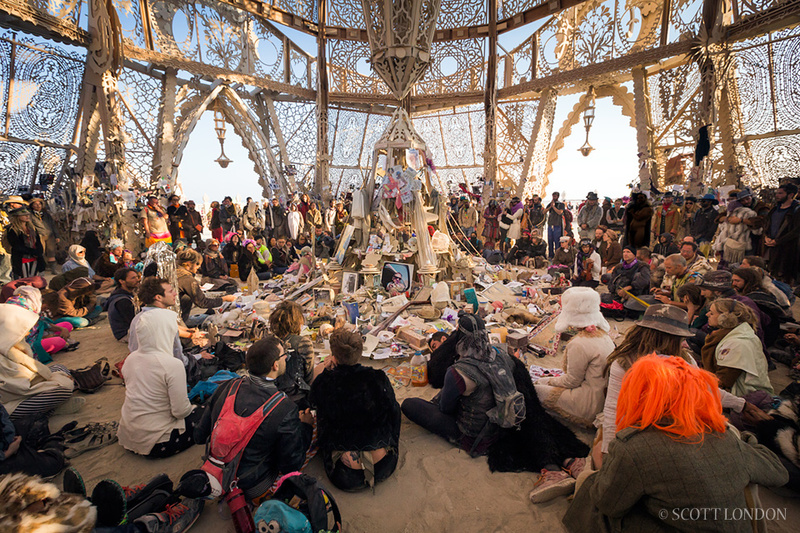 Burning Man is a wild cauldron of people, art, weather, and activity. I have learned a lot every year I’ve gone and I’m thrilled to be going again this year. Every year at the event a Temple is built in the open desert and people perform all manner of spiritual activities there. At the end of the week the temple is burned and consequently many people leave artifacts of their lives that they wish to let go of, release, forget, mourn, or honor in the final inferno. My first year at Burning Man I left a few final articles from a messy breakup and notebook filled with all manner of baggage I am happy to say I rarely recall. My second year I didn’t feel the need to shed any more emotionally leaden items and instead created a wand to call in all the magic I had been gathering into my life. My mantra for the year had been to be more gentle with myself and commit more fully to living a life in “YES!” I loved the colors and felt they energetically captured the momentum I was feeling at that time. Its fun to look back and remember the joy in my life that summer.